It is with great sadness that this post is released. The Gatehouse former Chair of the Board, Bruce McKay passed away January 17, 2019. Our sincerest condolences go out to his family, friends, and colleagues. Bruce was a dear friend, and advocate. We are all grateful and honoured to have known Bruce in this lifetime. Bruce was a light in the lives of many; bringing support, kindness, happiness, and comfort to many people suffering from past trauma. Bruce was a licensed private investigator who owned and operated a private investigation firm specializing in security consultations and issues of cross border transportation cargo theft investigation and prevention. Bruce had been a facilitator at The Gatehouse since 2010, participating in phase 1 and the phase 2 support groups for men and women. 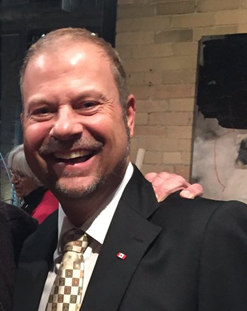 Since 2007, he had been facilitating male participant groups with “A Time for Men” which is an organization closely connected with the Canadian Centre for Abuse Awareness. He was an advocate, public speaker, trainer and support person for men and women who have been traumatized by childhood sexual abuse. He actively participated in the training of new Ontario Provincial Police sexual assault investigators, providing insight on what people need from a victim’s perspective. He appeared on the Oprah Winfrey show, the focus of which was to promote public awareness, support survivors in initiating the first steps of healing, and provide information. McKay, Robert “Bruce” December 5, 1966 – January 17, 2019 after a courageous battle with brain cancer. Bruce is survived by his Husband Ed Gallant, his parents Bob and Shirley McKay, siblings Susan (Peter) Harmsen, and Brad, and long-time best friend Venessa Kerman, along with nieces and nephews John, Courtney, Danielle, Taylor, Erin, Ryan and Alex, and great niece Mackenzie. Bruce lived his life with great energy and enthusiasm. He was generous, loyal and hardworking and exceptionally resilient. And a bit of a jokester. He faced evil and adversity with vigor and not only disabled dangerous entities but generously donated his time leading survivor groups. His volunteerism in helping others goes above and beyond. Recipient of the Queens Jubilee Medal and an OPP Commissioners award, Bruce’s commitment to wellness has not only helped, but saved lives. A man with strong family values who was incredibly loyal to his friends. Gratitude and thanks to all the Doctors and nurses and staff at Princess Margaret Hospital Palliative care and Kensington Hospice for incredible kindness and compassion to Bruce and our family. He is truly missed by all of us here at The Gatehouse.